You'll find yerself in cuffs tonight, but not like your usual run-in with Johnny Law. Still you never know when you might need a pair and these cuffs come off and are fully functional. 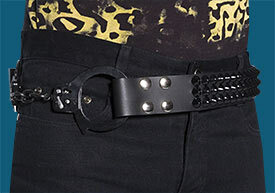 1-3/4" wide black leather belt with three rows of 1/2" black cone studs and handcuff close. 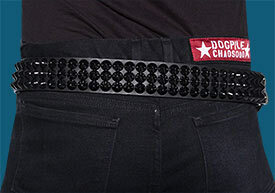 Snaps on both ends of the belt provide adjustment. Two Handcuff keys included.